Robert Lepage takes it home. Molly Grogan reviews. A memory palace is a mnemonic device for organizing and retrieving information by placing it within a familiar spatial memory, such as a house. It’s a technique as old as Ancient Greece and familiar to anyone with lots to memorize, which of course includes actors. 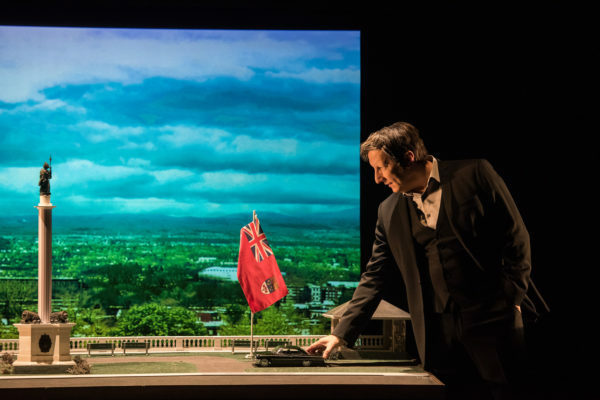 The Quebecois playwright, director and actor Robert Lepage uses the idea to frame and conceptualize 887, an intensely personal revisiting of his childhood in Quebec City in the 1960s, interspersed with a contemporary anecdote about his difficulty memorizing the seminal poem of Quebecois identity: “speak white” by Michèle Lalonde. Even in that short summary, which hardly encapsulates the complex construction that is 887, there are some weighty concepts: childhood and memory to begin with, and all of Quebec’s turbulent history and sometimes violent political aspirations, through which Lepage walks us using memory prompts, from the British victory over the French in 1759 to the October Crisis of 1970. Not long after Lepage takes the stage for what appears to be the “cellphones off” announcement, but which segues into his problem learning the poem, the “palace” of memory becomes the metaphorical structure for this two-hour solo show. In reality, Lepage builds a memory palace before our eyes; it is the apartment building where he grew up, at 887 Murray Avenue in Quebec City. He pulls it on stage, a scale model that reaches a little over his head, then fills it, apartment by apartment, recalling the residents of each: their behavior (compulsive, rambunctious, promiscuous), ethnicities (English and French, and one newly arrived Haitian family), music (Nancy Sinatra, Chopin), and even their late night conjugal spats. 887 Murray Avenue was a palace to the young Lepage: it held infinite, human riches to explore, as well as all of his childhood treasure, from his last memories of his grandmother to his first experiments with theater. But the palace he constructs on stage only exists in the realm of memory now; he can no longer enter it. When he opens the apartment building, he steps instead into his present day Montreal apartment, which houses the show’s parallel narration about Lepage’s struggle to memorize the Lalonde poem for a celebrity poetry reading (a thread offering a humorous counterpoint to his intimate reflections elsewhere). All that is left of the past are artifacts he can pick up and turn over. I mean that literally and figuratively, but the events recounted in 887 are authenticated, where appropriate or possible, by historical documents: photos of Lepage’s father, a publicity reel for the tea room at Quebec City’s Chateau Frontenac, the front page of Le Soleil dated October 18, 1970, reporting the War Measures Act invoked by Prime Minister Trudeau following the murder of the Quebec Minister of Labor by the Quebec Liberation Front (FLQ, its French acronym), the television broadcast of the FLQ’s manifesto, and others. Memory lodges in its own palace, made up of subterranean tunnels and grand galleries, and Lepage’s memories of 887 Murray Avenue shoot off into great halls of impressions left on him, a boy of ten, by Quebec’s cultural and political upheavals of the late 1960s. Of those, one that stuck with him was the afternoon he went with his father to see Charles De Gaulle’s motorcade pass through the city’s main park, on the French President’s first official visit to Canada in 1967. Lepage recreates the scene on a long table holding a model of the park, placing his cellphone on De Gaulle’s little Lincoln Town Car to film the cheering crowds (hand-sized action figures) as the motorcade passes them. The historical event ended in a diplomatic thunderstorm but the staged recreation is a moment of pure magic, captured in the boy’s blurred perspective and capped by a fanciful gesture straight out of a child’s playful imagination. The memory palace Lepage creates is much larger than 887 Murray Avenue, although its replica anchors the stage like an oversized dollhouse populated by video-projected, tiny, moving people. Once he starts unlocking memories, every prop, bookshelf and box contains a scene from his childhood: his grandmothers’ worsening dementia, storybook Christmases at the house of his wealthy aunt and uncle, the deception of being refused admission into a private school because of his father’s profession… And while it’s delightful to watch Lepage’s giant-like form tower over these miniature worlds, the most powerful moments of the show are when he jumps into them, to make shadow puppets with his sister, walk his paper route the day of the War Measures Act, and, above all, play his father – an uneducated, hard-working man supporting his large family on a taxi driver’s pay – at roughly the age of the world-famous Lepage, who, in the side narrative, worries half-jokingly over his legacy to theater. Eventually that adult Lepage has to take the stage at the poetry night but by then he has found his mnemonic device for remembering Michèle Lalonde’s poem; it is his father, whose story, we’ve been learning, is the one told by Lalonde, of Quebec’s working class, French-speaking population, marginalized by British- and US-aligned Anglophone Canada (“we are an uneducated, stammering people…”). This revelation is never voiced in the play but it rumbles and quakes in Lepage’s impassioned delivery of the poem at the show’s end. 887 asks why we remember some things rather than others and what is lost or created when we do, on a personal level, but also as members of communities and nations. We know that memory is unreliable and subjective and that we have a part in what gets remembered and what doesn’t. And yet anyone looking back at a decade-long swath of childhood would be hard pressed to tease a single thematic narrative out of those memories (the impossibility of that endeavor is the premise of Nature Theater of Oklahoma’s Life & Times, to take another example from theater). Ignoring the artifice of an imposed meaning, Lepage constructs his palace instead, and takes us through its rooms, as they seem to appear to him, that is to say in no particular order. His childhood was ordinary, basically, in Quebec in the 1960s; no family trauma, no extraordinary circumstances, nothing unusual for where he grew up, in the Montcalm neighborhood of Quebec City, on the edge of the northern extremities of the North American continent, where survival has never been taken for granted ever since Jacques Cartier’s exploration party came down the St. Lawrence river into Iroquois territory in 1535. The only remarkable aspects of his childhood come from its context, during Quebec’s swelling independence movement and whose violent culmination tripped the switch for the young Lepage’s coming of age. There are no grand themes here or life lessons to take away; even Quebec has never resolved the question of its sovereignty. But if 887 is essentially the story of a memory exercise, it is all the more authentic as the presentation of life as it is lived, in the moment, without much time to connect the dots. What makes the show memorable is its artistry. 887 is theater on a grand scale, that makes us feel pointedly and poignantly the fragility of the human condition, whose future depends on understanding the past, although our memories of what we ought to have learned from history seem to be fading more and more of late. It is storytelling as great performance, with Lepage moving seamlessly through childhood and adulthood, then sitting silently at a diner counter, dressed in his father’s work uniform, evoking all of his father’s worries, frustration and isolation with just the angle of his shoulders. It is art that marshals an ingenious arsenal of hi- and lo-fi techniques, thanks to Lepage’s company, Ex Machina, so that we can sense the fullness of emotion of those childhood memories and apprehend the complexities of the historical moment, from a few signs. 887 is proof again of Lepage’s unparalleled powers of observation and creative genius, which we now know were forged in the crucible of Quebec’s political and cultural revolution. The biggest tribute we can pay to his memory palace is to store it in our memories, as an example to be retrieved at will, and hopefully often, of life made art.